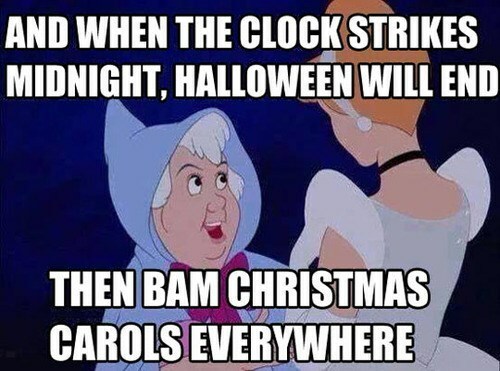 I made the mistake of looking at the calendar to see how many weeks between Halloween and Christmas. Don't do it! Seriously - don't do it! Enjoy dressing your kiddos up and filling yourself them full of candy because, before you know it, we'll be running around like a bunch of crazies trying to get everything finished up before Christmas! (and I seriously want to recreate this picture!). These two cute super heros - they have been friends for so long! 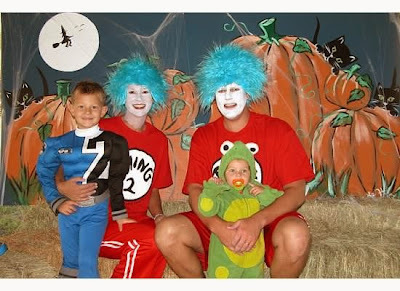 Mike and I went as Thing 1 and Thing 2 in 2005 while Holden wore Colby's hand-me-down frog costume. In 2007, all Colby wanted to be was an Aggie football player. I love a good theme so it was easy for Mike and I to go as referees. As much as I love a theme, sometimes you just can't pull it off for the whole family. I really wanted to dress Holden as a football, but I couldn't pass up the chance to dress her as this precious "mingo" as she liked to call them. They were her favorite zoo animal at the time! Colby was still wanting to be a football player in 2008 so he went as Brett Favre. We had just returned from Disneyland and Holden was all about Tinkerbell. It did make our costumes easy to decide! I was Wendy and Mike was Captain Hook. I was out-of-town for the 2009 Halloween party but I cracked up when Mike sent me this picture. Holden was suppose to be Ariel from the Little Mermaid! When Mike tried to dress her she flipped because the costume was "too itchy!" (how many moms have been there?!) so he looked in her closet and found this chicken costume my mom had scored on clearance. So, here's Frankenstein and a chicken! Halloween 2010 - have I mentioned we love a theme?! :) Sweet, baby Hope was just two months old - aaahhhh!!! For 2011, Holden wanted to be a witch and Colby wanted to be a werewolf. Sadly, the older they get, the less cute their costumes get. :( I had saved Holden's octopus costume and I couldn't wait for Hope to wear it. Hope wasn't quite as impressed! This is possibly my most favorite Halloween costume picture.ever! Halloween 2012 - the soccer player and a couple of cute Dalmatians! I made the girls' costumes using a white t-shirt, black fabric paint, and lots and lots of tulle! My favorite part? They used dog bowls instead of bags for their candy! 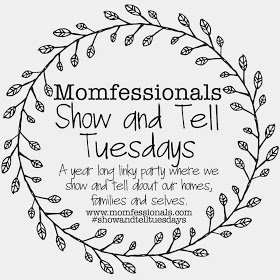 I'm linking up with Andrea at Momfessionals for her Show and Tell Tuesday. Stop by and see all the other fun trips down memory lane!!! check our my FAVORITE link-ups here to see where I'm linking up today! I wanted to tell you that one of our daughters Sigma Alpha sorority sisters (and fellow home town girl from tulare) is going to A&M for grad school! She just announced it two days ago. Taylor is so excited for her sister and already planning to go visit! I think my daughter will eventually end up there as well, because Ag Management Grad schools are hard to come by and my daughter is a die hard Bulldog AND Aggie fan. She is die hard AG anything! Have a fabulous day! I was worried that you would think I was dorky for sharing that information with you! I will see Chandler this weekend at the parents bbq, so I will tell her I 'know" someone in College Station! Her parents are both teachers here in Tulare and Chandler is just a super sweet young woman but I can not imagine going off and not knowing ANYONE! Eeek! That just may be my Taylor if she accepts a job out of state. Thank you so much for being so kind. It does seem weird but I feel like we know each other just thru this and IG! I will be in touch!! Thank you again!! My hubby applied to Cal Poly and Texas A&M. He received acceptance first from A&M, loaded his truck and drove to Texas. Keep in mind - he had never even visited the school!!! Crazy! I couldn't imagine doing something like that! But, he loved it and has made Texas home for the last 20 years (crap! that makes us sound so old!). Tell Chandler not to worry! Aggieland is the friendliest campus she'll ever be on! She'll get settled in no time (but I'm here if she needs me!). I love, love, love that you get in to the spirit too!!!! That octopus though- so cute! I loved that octopus costume!!! It's so cute when they are just starting to walk and all those legs are everywhere!!! Thanks so much for stopping by! OMG! I LOVE this post! You had me at the Cinderella funny and then I saw all the costumes! So much fun!! Ah, thanks, Laura!!! It's always a fun time of year! Wow, you all had some cool costumes!! It's so nice to have all these pictures to look back and how your family has grown and all the fun times you have together. I might dress Cocoa :) We always said we would never be those people that put a sweater on our dog but she gets so cold so we bought her one :) Hope you are having a nice day!! I ADORE your creativity and how you all dress up!!! That octopus is SO cute…. and love the skeleton ones too!!! Thank you so much, Sarita! I wasn't much on dressing up when I was younger but it's definitely more fun when you have kiddos! Thanks for stopping by! That was so sweet, Megan! I appreciate your comment!!! It's a lot of fun and they do get bummed when we don't dress up too! Not sure that we'll dress up this year but I'll at least wear a fun Halloween t-shirt! ;) I'm so glad you stopped by! Hope to see you around again soon! I can't believe how much you put into this! Absolutely adorable for everyone involved. They all could win best costume! 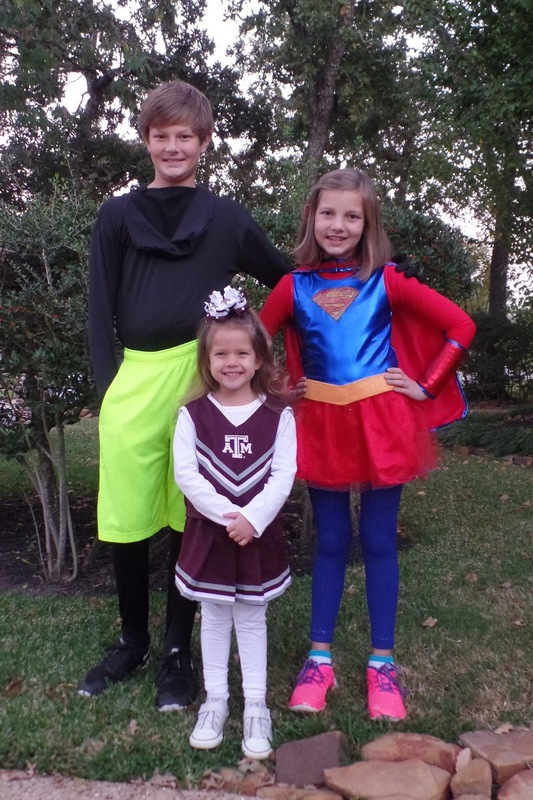 All of their costumes are so cute, and I especially love the fact that your son wanted to go as an Aggie football player one year! I thought that the South Carolina game was going to be a night game. I guess that they were just hoping and we got an early game. I love looking at these pictures, but it is kind of sad too. My girls are 18 and 21, so no cutsie costumes anymore. But we did dress in Disneybound this summer for our trip to Disneyland! It is kind of sad when you realize how quickly they grow up! 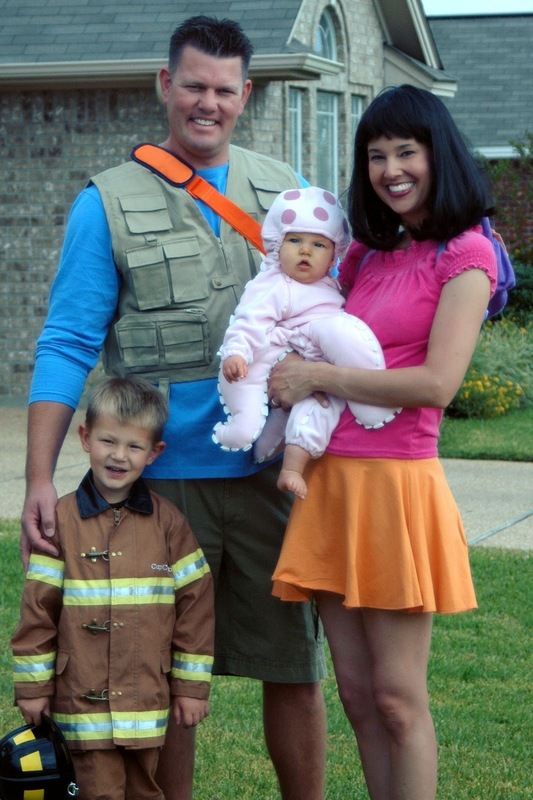 Seems like yesterday that Mike and I were dressed as Dora and Diego with just two kiddos! I love that you guys dressed up for Disneyland! So much fun!!! It really is a lot of fun! Sadly, we aren't dressing up this year. I think we need to work on that for next year! I know there was a reason the girls dressed up as dalmatians but, for the life of me, I can't remember why! #mombrain It was a fun costume to put together (even if most people thought they were cows) haha!!! I love all your costumes...such fun dressing up as a family! Thank you, Emily! I think all the conversations before when we are trying to decide are just as much fun! They can come up with some crazy ideas! Thanks for stopping by! My daughter that just got married is a Cal Poly alum! 2011. And she still makes her home there !! San Luis Obispo is a beautiful town!! See?! Small world! We quickly drove thru SLO on a recent road trip from NoCal to SoCal and it was very, very beautiful! Thank you, Jessi! It's always fun to look back and see how everyone has grown and changed! Thanks for hosting! I'll see you again next week! Oh my goodness Holly, how precious!!! I have a post next week about our Halloweens over the years. We don't have kids, but we have always done stuff each year :) This was so cute! I can't wait to see it!!! I love posts that take a trip down memory lane! So fun! 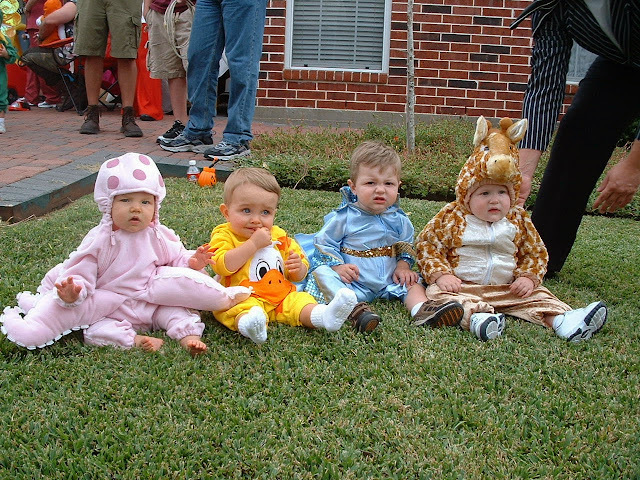 LOVED READING YOUR POST...cute costumes and what a fun time your family always seems to be having. Great idea to take that trip down memory lane. Thank you, Pamela! It's always fun to have a reason to dress up! Thanks so much for stopping by! Your pictures are so adorable. The best one hands down is the baby looking at herself in the mirror wearing the octopus costume. They sure do grow fast. Thanks for sharing your precious memories with us. Thank you, Mary! It's one of my favorite pictures too! Thanks for stopping by! Hope you're having a great day! Hi, Laci! Thanks for stopping by! Halloween is always a fun time! My crew is definitely looking forward to it! This was seriously one of the coolest things to look at. I'm so impressed that you got so many photos. I don't even know which costumes are my favorite but the picture of your daughter crying in the mirror in the octopus outfit...priceless haha! I do like the Dalmatians costumes. My FIRST daughter in 4 months old right now so seeing this post makes me realize I absolutely have to take family photos this Halloween. Even if we don't all match, it's a family getting together and being silly. Thanks for the inspiration & for liniking up with us at Welcome Home Wednesday! Ah, thanks, Samantha! Absolutely take family pictures on Halloween - and every other holiday. It's easy to pull off because there are normally lots of people around to snap a pic and get YOU in the picture (since we are normally the picture takers). Thanks so much for hosting! I'll see you tomorrow! So cute! Thanks for linking up and sharing! Love the Dora and Diego outfit! Thank you for hosting! Hope to link up again soon!